Sister Nicolette Vennaro, OSF, instills a love of drama in her students at Blessed Sacrament School. Sister Nicolette Vennaro, OSF, 3rd grade teacher and drama coach at Blessed Sacrament School in Syracuse, is somewhat of a legend. She is known for producing theatrical productions for the last 52 years at Catholic schools in New Jersey and the Syracuse Diocese. At 72 years old, Sister Nicolette has boundless energy. Besides serving as a source of inspiration to her 3rd grade students and the children in her drama classes, she is a long distance runner who has competed in marathons throughout New York State and in Hawaii. “I get a sense of inner peace when I’m running,” commented Sister Nicolette, who also works out at a fitness center regularly. Over the summer, Sister Nicolette coaches the school’s track and field team, the Tiny Eagles. 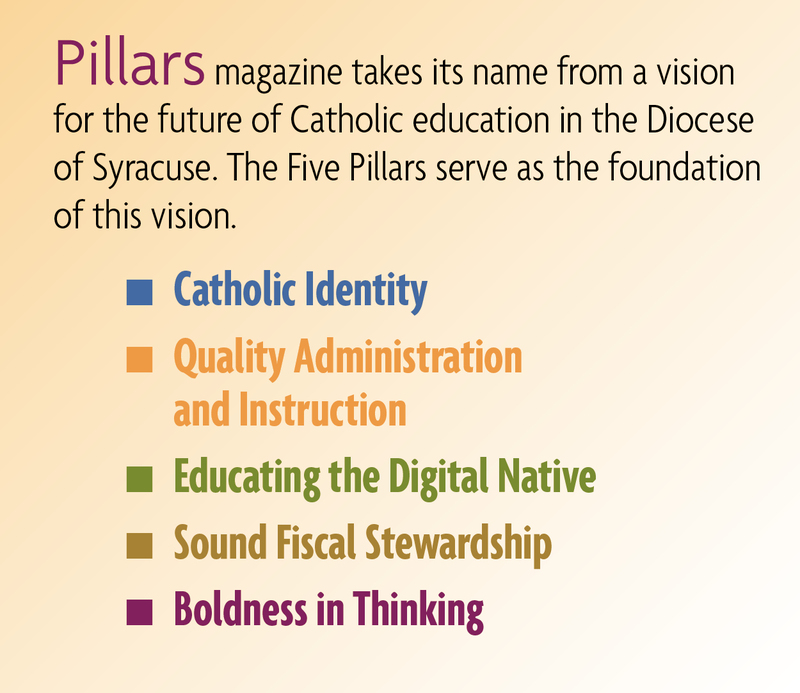 A native of Utica, NY, Sister Nicolette grew up in the parish of St. Francis de Sales. She attended D’Youville College in Buffalo and Scranton University. After teaching at St. Joseph’s School in Camden, N.J., she served at St. James, St. Rose of Lima and at St. Lucy’s schools, all in Syracuse, before coming to Blessed Sacrament 12 years ago. Today, Sister Nicolette enjoys her 3rd graders immensely. “They’re so eager to learn, and I love their honesty,” she said. Sister Nicolette produces one theatrical production every year. “Usually, 90 children sign up — almost one third of the school,” she explained. The number of children that sign up usually number far more than the parts that are available, so Sister Nicolette rewrites the play in order to give everyone a part, instinctively knowing what part should be given to which child. She observes the children through the drama classes held after school, one for 1st, 2nd and 3rd graders and another for 4th, 5th and 6th grade students. 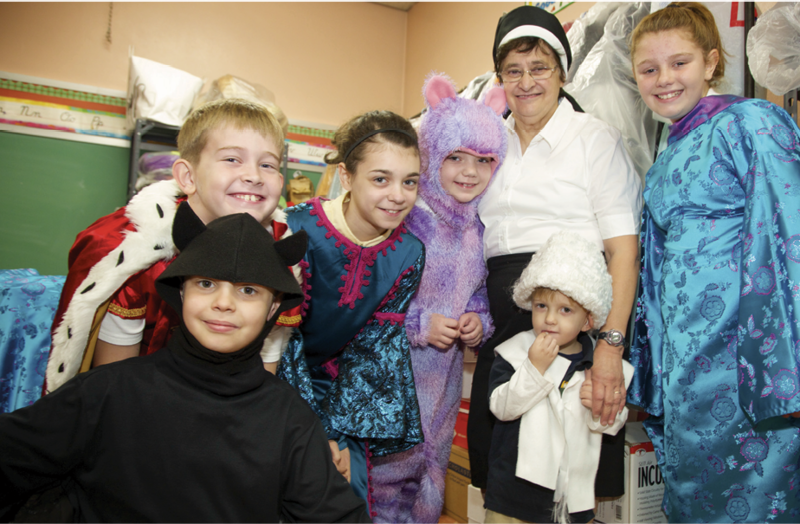 By enrolling in the drama classes, Sister Nicolette said, the children discover talents that they didn’t know they had. She thinks it’s beneficial to practice music, dance and public speaking. Their progress is enhanced by the fact that, at their age, they don’t feel self-conscious when performing. “Their singing is great,” remarked Sister Nicolette. “We have a great music teacher, Mary Lynn Giacobbe, to help them along.” Starting each January, Sister Nicolette assigns the parts to the children, and they begin to practice the play, scene by scene. They usually rehearse one to two times per week. Known for her dedication to her students and to her productions, Sister Nicolette devotes her spring break to preparing the props and scenery for the play, building and painting the sets. “I love doing it,” she remarked. Each spring, the children perform their play at the Palace Theatre in Syracuse, as well as several performances at Blessed Sacrament School. Last year, she produced Rocking Snow White and has also directed Mother Goose, Peter Pan, The Wizard of Oz, Little Red Riding Hood and Pinnochio. She is especially proud of the time that she and her students were invited to a drama competition at Hamilton College to compete against schools throughout New York State. Her 109 Blessed Sacrament students placed second in the competition by performing Alice in Wonderland. “I thought they should have won first prize,” she said.